I’m supposed to begin by introducing myself, but that seems a strange task when everyone already knows me, by one name or another—something for which I’ve longed almost my entire life, though certainly not in the way it came about. Which name? Which reputation? I guess that depends on your point of view. Nevertheless, whatever you may think you know about me from the news and social media, I promise you, it isn’t the whole truth. When anyone with a smartphone and an online profile can pen their own headlines, the facts soon become skewed. That’s why I’m here, writing my tale. It’s my one chance to set the record straight. At least, that’s what they all tell me. Good and evil. Black and white. Hell, even yin and yang. It’s never as clear-cut as it might first appear, and so much depends upon your point of view. Inside every hero is a villain, trying to claw his way out. Within every villain, a hero waits to burst free. There’s often a damned fine line between the two, and the catalyst can be anything, from the sublime to the ridiculous. For Dr. Jekyll—he of literary fame—it was a potion. For me, it was a man. Still, I mustn’t get ahead of myself. If I’m going to tell this right, I need to start at the beginning. Asta Idonea (aka Nicki J Markus) was born in England but now lives in Adelaide, South Australia. She has loved both reading and writing from a young age and is also a keen linguist, having studied several foreign languages. 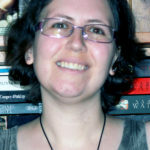 Asta launched her writing career in 2011 and divides her efforts not only between MM and mainstream works but also between traditional and indie publishing. Her works span the genres, from paranormal to historical and from contemporary to fantasy. It just depends what story and which characters spring into her mind! As a day job, Asta works as a freelance editor and proofreader, and in her spare time she enjoys music, theater, cinema, photography, and sketching. She also loves history, folklore and mythology, pen-palling, and travel, all of which have provided plenty of inspiration for her writing. She is never found too far from her much-loved library/music room. 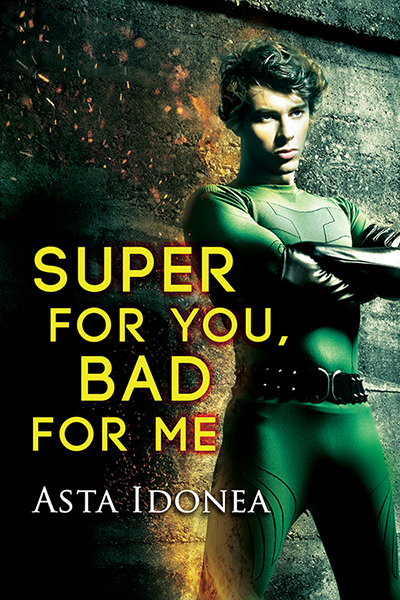 What was the inspiration behind Super For You, Bad For Me? I’m a big MCU fan girl, having come to those movies via seeing Tom Hiddleston’s performances in Shakespeare. (A bizarre trajectory, I know.) I’d had in mind for a while that I wanted to write a superhero piece, and then, in 2016, Oswell popped into my head. He was perfect for the lead role, and the more time I spent getting to know him, the more clearly the plot formed. I am often drawn to anti-heroes and villains, so I wanted to write a story that looked at the line between good guy and bad, and questioned what it would take to make someone cross it. There’s a big leap a writer takes from putting words down on paper for the love of it and actually publishing those words for public scrutiny. What was that journey like for you? I started with fan fiction in my late teens/early twenties. I got some positive comments from readers, but then I went travelling, ended up moving to Australia, and everything went on the back burner for a while. It was in late 2010 that a friend, who was published, suggested I should write something original. I commenced with a vampire short story, and from there, I didn’t look back. For the first three years I wrote MF genre fiction, mostly paranormal and fantasy. During that period, and into 2014, however, I had started to take on some editing work, often LGBT stories. I’d written slash fan fiction, so I decided to try my hand at an original MM tale. Now, although I still write the occasional MF work, I predominantly write gay romance, across many different genres. I love sharing my stories and characters with others. I only hope readers get as much joy reading their exploits as I had creating them. What one piece of advice would you give an aspiring writing? Don’t skip editing. It may be expensive, but it can mean the difference between putting out an average book and producing a great one. I’m a qualified freelance editor, but I still have editors for my published works. It’s easy to miss things in your own prose, because you are so familiar with it. An editor is a step removed and can see things you can’t. They are there to help you create the best possible book, so make use of them. What do you think makes a good story? I think it’s about meeting readers’ expectations while also offering something new. That’s especially true in genre fiction. You have to tick all the boxes but at the same time produce something that feels fresh and not a rehash of what people have already read. To my mind, characters play a big part in that. If you can create characters that stand out and stick in a reader’s mind, you’re halfway there. What can readers expect from you next? I am currently waiting to hear back from the publisher on a MM PNR novel. If that is accepted for publication (as I hope it will be), it will be coming out in 2019. In the meantime, I am working on two more MM PNR stories. One is contemporary, with a focus on witches. The other is historical, with vampires. Least favorite endearment: Sugar, maybe, but I’m not completely against anything, as long as it’s respectful. You’re auditioning for a singing competition, what’s your song: ‘On My Own’ from Les Misérables, but sung in German or Czech. Or else something from a foreign-language musical. I like to be different. If you were ice cream, what flavor would you be: Vanilla. I prefer a simple base to which you can add anything. Sleep with your socks on or off: Off in the summer, but on during cold winter nights. Ask for permission or ask for forgiveness: Permission, I guess, but I could go either way, depending on the situation.